Pictured: Oak shingles that cover the Chêne Chapelle’s exposed, bark-less areas. 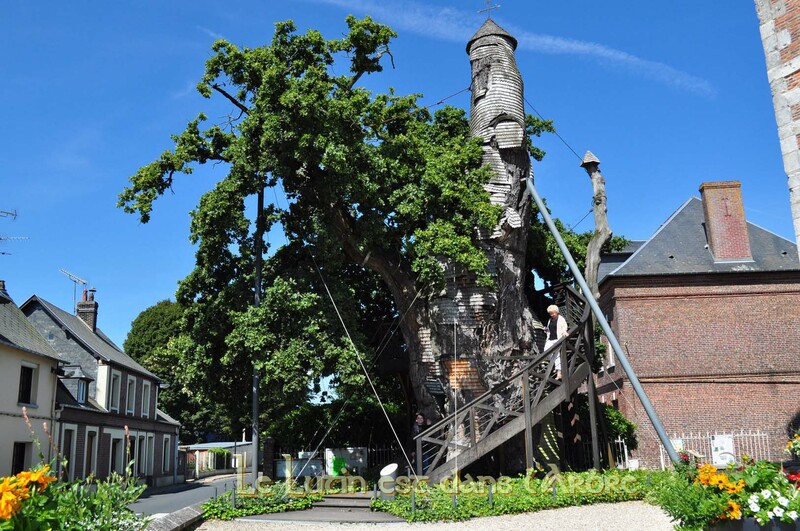 If you ever find yourself in Allouvile-Bellefosse, France, you might care to visit a particularly unique and whimsical tree. Like something straight out of the fairy tales of antiquity, the Chêne chapelle has attracted visitors from all over the world! As the oldest tree in France, it has survived the French Revolution, all manner of weather including a devastating lightning strike, and the regular wearing of time. But it isn’t its resilience that wins as the most interesting feature of this tree, or even its age—inside its hollowed out trunk you’d be delighted to find two small chapels! Pictured: 18th century engraving of the Chêne Chapelle. still manages to meet twice a year, and it remains a destination of annual pilgrimage. This special oak first became a chapel in the 1600’s. This is when it was struck by lightning, causing it to be burnt right through to the center. Surprisingly, the tree survived, drawing the attention of a local abbot and the village priest. The two men determined that this tree’s survival was a sign from God, and so inside they built and dedicated a shrine to the Virgin Mary. In later years, the second chapel was added, along with a winding staircase on the outside of the tree. Locals will say the tree is as old as France itself, existing during Charlemagne’s time and rumored to be where William the Conqueror once knelt at its base. Local tradition places this tree at 1200 years old, but scientists say that it’s more likely to be closer to 800 years old. Either way, this chapel oak has certainly earned its place as a religious, historical, and tourist hot-spot!